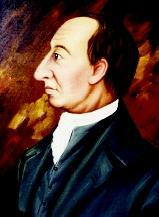 James Hutton developed theories on rock formation and erosion that became known as "Huttonian Geology." This portrait was done by Abner Lowe in the 1920s. Huttonian Theory of the Earth," was published in 1802. It was a clear presentation of Hutton's ideas, and ultimately was used as the basis for geological theory. SEE ALSO Erosion and Sedimentation ; Fresh Water, Physics and Chemistry of ; Garrels, Robert ; Stream Erosion and Landscape Development ; Weathering of Rocks .